Tembo Puts the Spotlight on Your Files. The beta should be ready soon. The public release will follow later this summer. Are there any screenshots? Glad to see it is getting some of HoudahSpot's power. - I like the new buttons for tasks and sharing. It would also be convenient to have a button for detailed searches. I access that feature constantly. - The Finder's search tokens would be very nice to have. Is there an easy way to bring that feature across? - I prefer version one's dark colored file dividers since they provided more contrast between the text and the background making it easier to read. - Bringing HoudahSpot's file info window across is good. Could it also be put in one window like it is in HS? 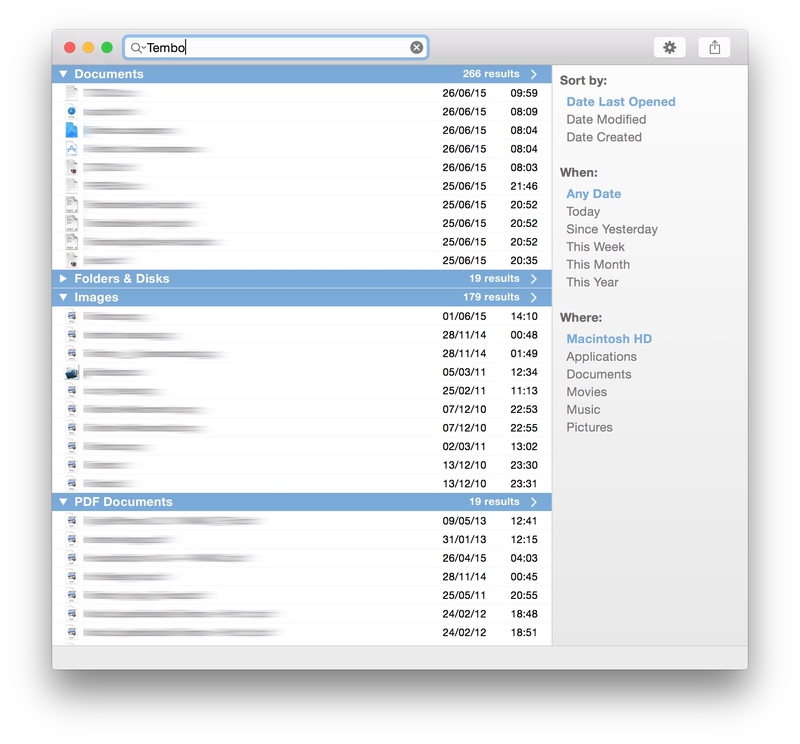 Cloning the Finder search tokens would be momentous task. I am still experimenting with different colors for the group headers. The latest beta now uses a darker separator color for higher contrast. That seems easier to read. It could even be a hair darker. Both Tembo 1 and Finder worked well since they were both high contrast. Tembo was light on dark and Finder is dark on light. I just realized I should have explained one of my feature suggestions better. I think the "new detail search" feature from the file menu should also be on the toolbar. I never understood why such a predominate feature would be buried under several menus and sub menus since that is often the first thing someone will do when performing a search. I didn't realize adding tokens was a lot of work. I thought it might be a feature that Apple just made available to 3rd party developers. That is too bad it isn't.